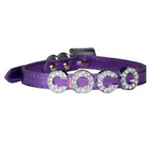 Dazzle your pet with a gift of this Foxy Metallic Slide Dog Collar in Lilac from Cha-Cha Couture! I've had to get two sizes in this as Paisley grew and both are the same thickness, unlike a lot of collars which I like. I don't need collars to attach to a leash, just to hold her tags because she's in harnesses for the leash factor. This width is perfect for that and isn't so overwhelming that it bothers her. She does try to chew on the excess but I'm sure will grow out of that (I hope ... HOPE). 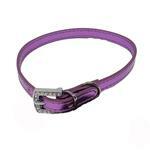 There is just enough bling, too, around the buckle but it's not gaudy looking and is a nice, thin row of rhinestones. And the metallic is a classy looking metallic - not an "in your face" metallic. It's very, VERY tasteful all the way around! And at this price I should get a few for backup because when ya' find something that works - it's hard not to stock up, especially at this price!